I am the author and editor of Vegancruiser.co.uk blog. I launched Vegancruiser in early 2016 to show our friends that I could continue my cruise adventures even after becoming a vegan. A blog that started as a means to educate friends locally, in two years has become a cruise & travel blog (with a vegan ethos) that has a worldwide reach. Vegancruiser blog is a hobby, to which I would like to give more time. I’ m a full-time working professional based in central Scotland. Although I am a former travel graduate, and worked in the trade briefly, I am now employed in a totally unrelated field. I am in my early 40s and share my home with my vegan husband and our three spoiled cats. While my husband and I love the cruising, the ungrateful cats do not, as they end up in a luxury cattery during the time we are away travelling. My cruise habit started at the tender age of 6 months as I sailed with my parents until I left home and moved to Scotland. From my family cruising past I knew cruises are for everyone, regardless of age or dietary need. Yet, it was only 10 years ago I convinced my husband to cruise for our wedding anniversary and we started cruising as a couple. He had the usual reservations. 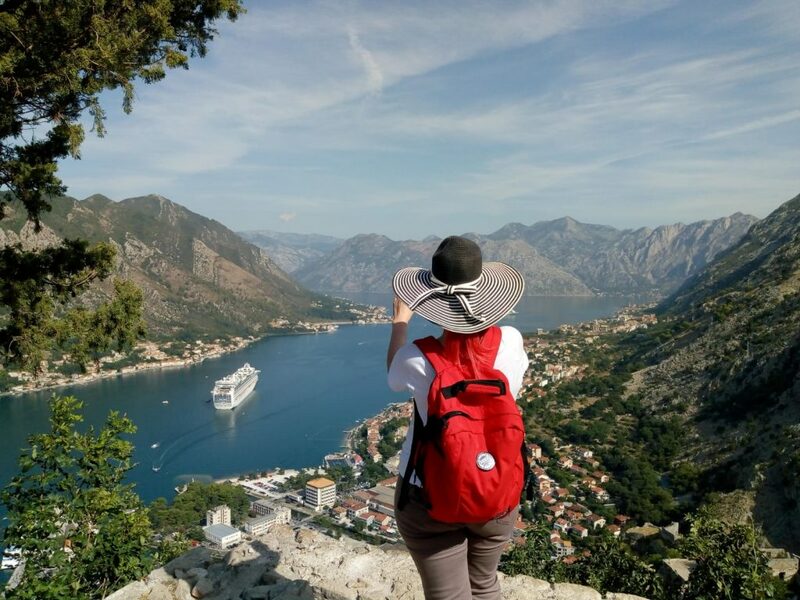 It is safe to say that those myths he held have been long busted and with each cruise we take our appetite, for both cruising and for more luxury, grows. 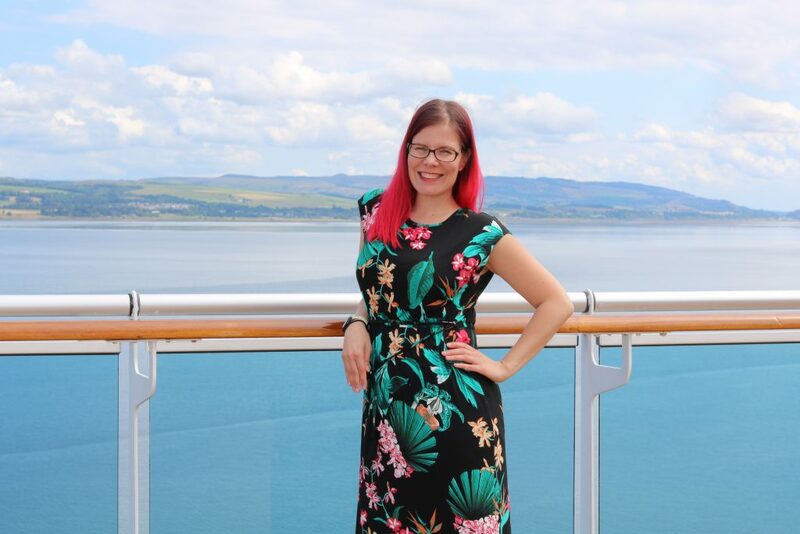 I am honoured to have received a nomination in the ‘Best Cruise Blogger’ category in the Cruise International Wave Awards for the last two years running. First was for the 2018 Wave Awards in March this year and I am now listed for the 2019 Award as well. 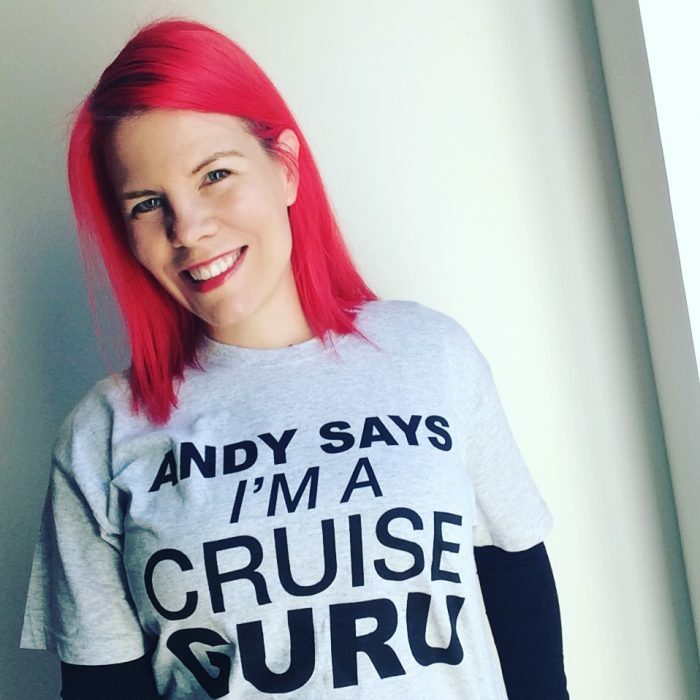 I really appreciate my CLIA UK ‘Cruise Guru’ t-shirt which I received for highlighting the fact that cruise bloggers are cruise specialists too. We know what we love, inside out. We speak of our favourite holiday type with both passion and authority, and work to convert our peers into cruisers like ourselves. Even if we have to pass on these people on to the travel agents to make the bookings. In the last two years I have had the pleasure to work with not just Princess Cruises UK, but also MSC, Oceania Cruises and Viking Ocean Cruises. I’m always looking to showcase cruise lines and ships not yet featured on my blog. Please do get in touch regarding ship visits, tours and collaboration opportunities to be featured on Vegancruiser.co.uk or across my social media platforms. Collaboration requests from brands and products that both fit my vegan lifestyle and would benefit my readers are also welcome. Most recently I product reviewed a UK based travel handbag by MiaTui. 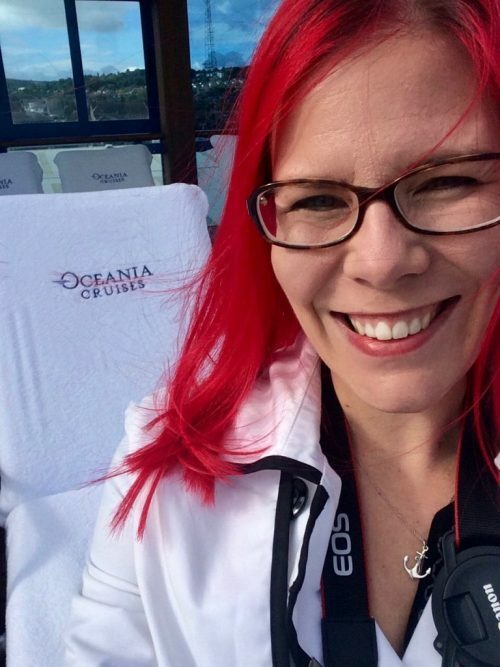 I have also been featured as an expert on cruising & vegan travel on articles by cruise travel agencies such as ROL Cruises and JetlineCruise. I am always happy to offer my advice to individuals and organisations, in fact, I wish more cruise lines listened to experienced cruisers like myself with dietary limitations to further improve their service. 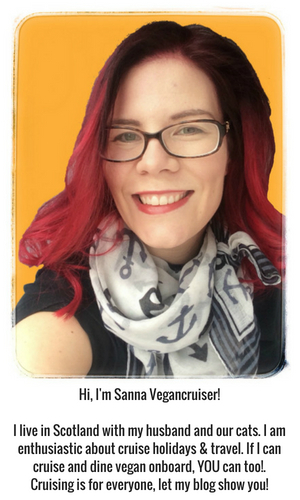 If you wish to contact me, be it for the blog or my social media channels or both, please use sanna @ vegancruiser.co.uk for your correspondence. Do note, that as blogging is a part-time hobby and I work shifts full-time, I may not always respond immediately. Would you like to submit a guest post? I am open to guest posts from vegans who want to share their vegan cruise experience with my readership, as it is important we share our knowledge about a particular ship and company. Interested in submitting a sponsored post? I have chosen so far not to accept any sponsored posts for my blog or Instagram, but should I choose to, these will be clearly marked as sponsored for both honesty and my personal integrity as a blogger (and to follow ASA guidance on influencer marketing). As per Google guidelines, any sponsored blog posts link or links will also be no-follow links. If you are still interested in pursuing a sponsored post, please contact me at the e-mail above. Thank you.